I apologize if tangy cheese isn’t your thing. Honestly, it wasn’t mine for a long time. If someone would have told my younger self that I would eventually fall in love with pungent, flavorful cheese, I would have laughed at them and continue to eat my cheddar. There is a place for all cheeses but I have to say, blue cheese and I are becoming fast friends. I landed back in Illinois to colder temperatures and a rather “blah” scenery compared to Sacramento which was in full bloom. While the weather in Illinois isn’t cooperating with spring, I felt it time to move to into spring dishes. 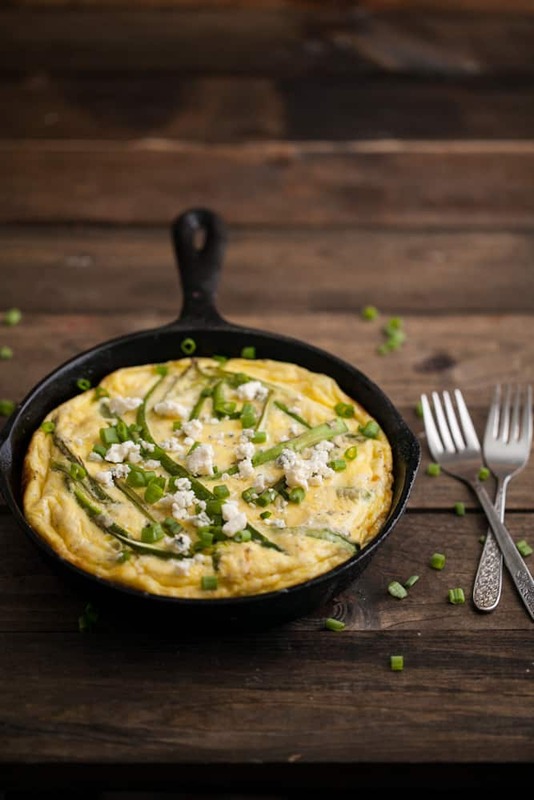 There are many things I love about this frittata. Roasting the asparagus and green onions together (roasted green onions are delicious). The combination of the roasted veggies with blue cheese (not using too much helps balance everything) and the lightness of the meal. Of course, if blue cheese isn’t your thing, use a cheese that is. Goat cheese with be my second choice with white cheddar as my third. Don’t skip the roasting of the asparagus/green onions though- I think it makes the flavor. Remove part of the dark greens from the green onions and set aside. 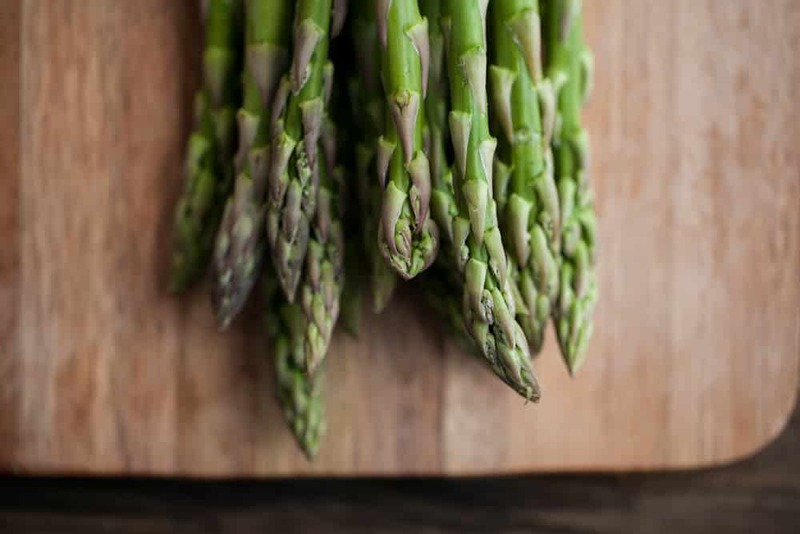 Remove last 1/2″ of asparagus if needed. If asparagus stalks and green onions are thick, carefully slice length-wise in halves or even quarters. Toss with 1/2 tablespoon olive oil and roast until tender, 10-15 minutes. 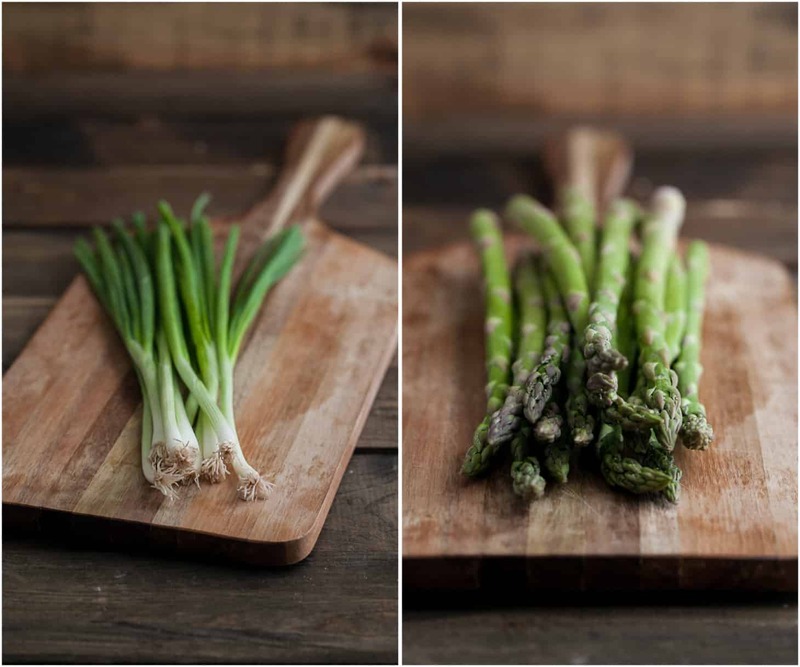 Once asparagus is close to being tender, heat 1/2 tablespoon olive oil in an 8″ cast iron skillet over medium. Whisk together eggs, milk, salt, pepper, and blue cheese. Pour into hot skillet and let cook for 2-3 minutes. 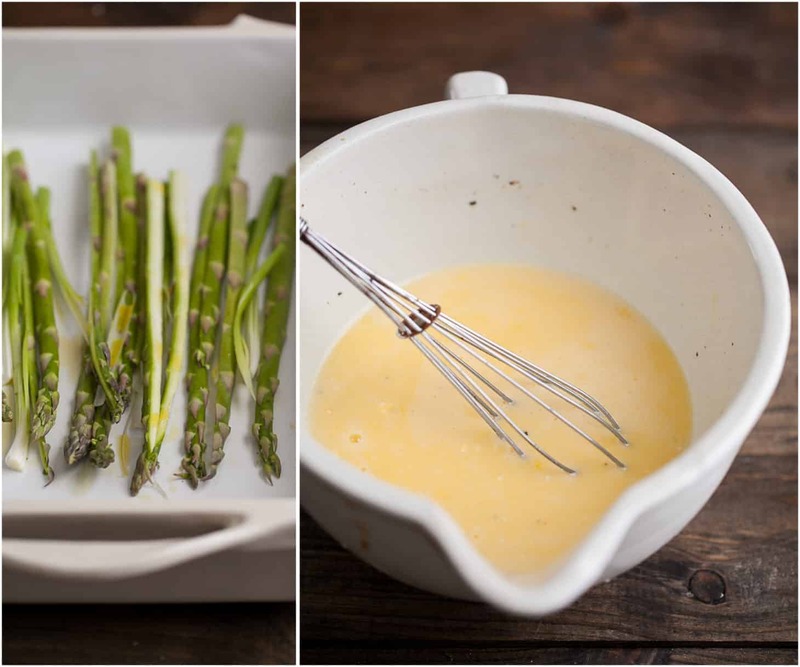 Take tender asparagus mixture and layer in the eggs as they cook. Continue to cook for 2-3 more minutes, or until bottom begins to set. Transfer skillet to oven, still at 400˚, and continue to cook until set, 8-10 minutes. Serve with extra blue cheese and finely diced dark green onion bits. Oh my word. 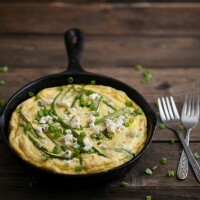 This frittata looks so pillowy!!! I’m patiently waiting for local asparagus to pop up around here. Not sure how much longer I can hold out! This looks so good. I am the only one who will eat a frittata in my house. I really need to find a small skillet to make them just for me! wow that looks great thanks for sharing!! Gorgeous recipe and photos, lady! Beautiful! I love everything about this. 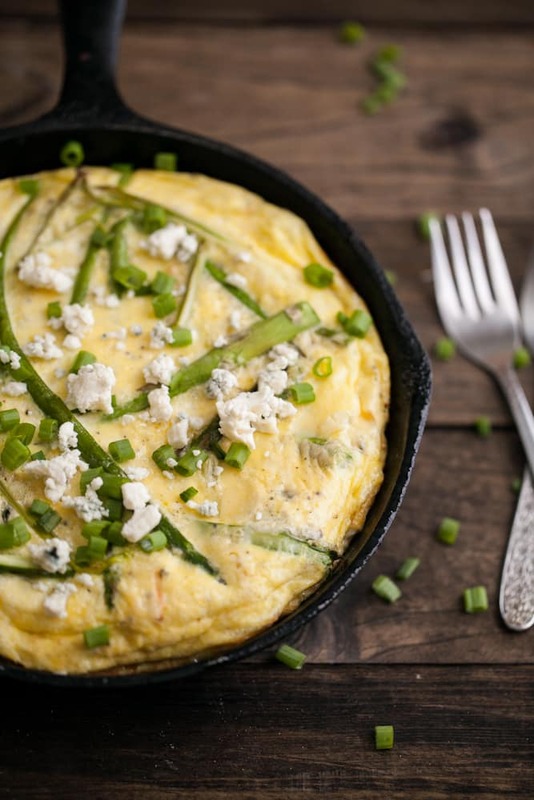 The asparagus, the eggs and of course the blue cheese! I love blue cheese! I’m quite confused when it comes to the names. 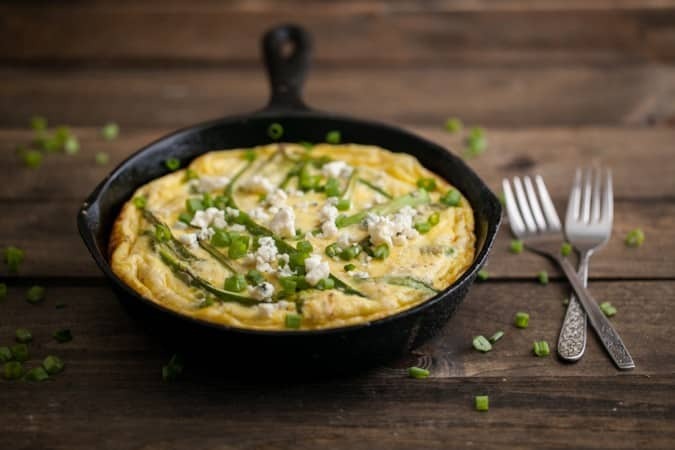 You call it “frittata”, but the frittata I know is made without milk and it’s quite flat. The dish with milk (and flour) that is thick and more pancake-like would be called an omelet (or a baked pancake). Do you know where the name confusion comes form? 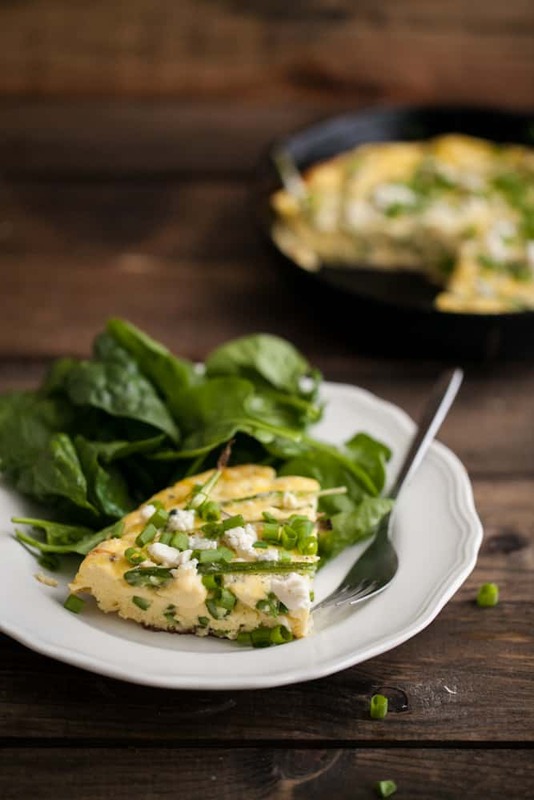 What’s not to love this frittata!? It looks so fresh and delicious. You photos feel so rustic yet simple, love it. and um, I definitely need to make that Frittata! I tried this recipe this evening and it was DELICIOUS. Perfect taste combination. Thanks for posting the recipe.